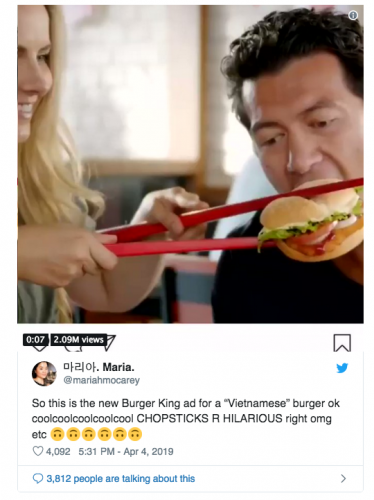 Burger King in New Zealand has been accused of racism and cultural insensitivity after running a campaign that showed befuddled customers trying to eat hamburgers with chopsticks. 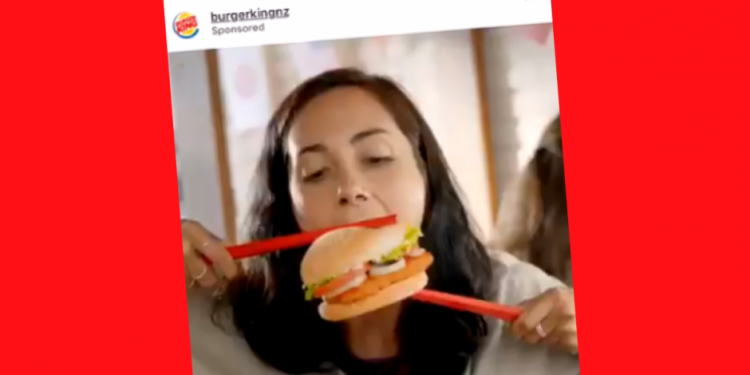 The apparently humorous Instagram campaign was designed to promote the burger chain’s new Vietnamese Sweet Chilli Tendercrisp burger and saw several customers try and eat them with oversized chopsticks. “Take your taste buds all the way to Ho Chi Minh City with our Vietnamese Sweet Chili Tendercrisp, part of our Tastes of the World range. Available for a limited time only,” a caption for the ad read. And it appears plenty of people agreed with Mo’s views. As of yesterday, her post had attracted more than two million views with many people outraged that Burger King management had approved the ad. In an interview with the Huffington Post, Mo said: “Because I couldn’t believe such blatantly ignorant ads are still happening in 2019, it honestly took me a second to work out what the heck I was looking at. “[People of colour] are constantly having to deal with microaggressions as well as outright hatred and it just never ends,” she added.